I first introduced myself to Doctor Who in the winter of 2013, I had just recently joined tumblr, and was also accepted into a study abroad opportunity that would have me in London for 2 weeks in May. To read about that experience you can travel on over to my other blog. You may wonder why I’m tell you all this, but I’m getting to that Mister Impatient. I once before tried to watch The Doctor, but found it near impossible to get past the first ten minutes of the 2005 revival. I gave up, but then I joined tumblr. I followed fandom bloggers because I myself enjoy movie and TV gifsets and references. I then became a fandom blogger. My world was surrounded the SuperWhoLock, while I was only a part of the Supernatural fandom, and was slow at keeping up with the more recent episodes to begin with. It was doctor after doctor of funny quips, clever lines, and beautiful plot lines and scenery. I knew I had to be missing out on something. That something eventually became a much bigger portion of my life than I could have ever imagine. My first Doctor was Christopher Eccleston, the ninth incarnation of The Doctor. And although I just wanted to get to Tennant, the Tenth, I enjoyed Eccleston’s portrayal. 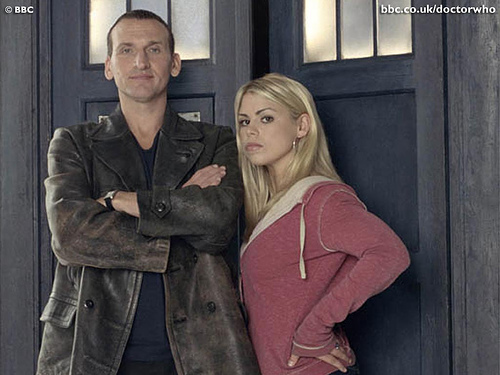 After beginning at Rose the other day, I truly appreciate how fantastic and sassy Eccleston was in his big leather jacket. The second bout around, I can understand the English accents better and therefore catch more of the witty, clever lines in the show. And of course, I am more watchful of the TARDIS in the background shots, before, when I began, I never knew how important the TARDIS is to the show. As you may realize now, I have seen every episode offered on Netflix, which is where I watched it. So I am through Series 6, but have watched 6 episodes of series 7. Something that I am really enjoying about going back in time, is that I get to experience Rose again. Someone who was completely ordinary, and then, because of her travels with The Doctor, she became extraordinary. That is something the newer episodes lack. Normal people who become the Doctor’s companions, that then grow and change for the better. If you yourself have never watched Doctor Who, then you sir or madam or alien, whatever you are, are missing out. It can be a difficult show to stomach with some episodes here and there, but trust me the acid reflux is worth pushing through to get to those real golden episodes. Doctor Who is really my first SciFi TV show that has gotten me head over heels, and also my first BBC show. (don’t worry it is not my last.) If you need anyone to help you through the confusion, come to me, my future whovians. Comment below and I can help you get through the tough spots, because I too, was recently there. And if you were already a whovian, what was your experience like going back and starting from the beginning in 2005? Did you smile at it fondly and quote to your little hearts desire? Because I certainly did. It’s always great to come upon someone who has just discovered Doctor Who. I highly recommend that you go back and visit the Classic Series. Wow! That seems like quite a challenge to do. But I suppose that it’s only a post a week. I find it challenging to write reviews on just one episode of the show. I will certainly stop over and check it out! Maybe reading your blog will get me to watch from the 60s on.